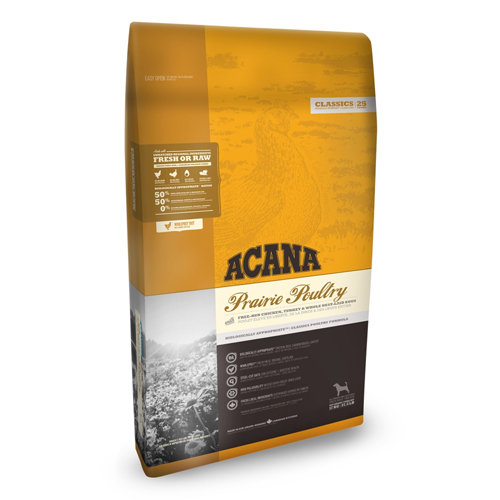 Acana Classics Prairie Poultry is a tasty food for your dog. The food is made from the meat of free range chickens and turkeys and contains meat proteins and Omega 3 fatty acids that support your dog's condition. Prairie Poultry is suitable for all dog breeds and phases of life. Dogs have evolved as carnivores, biologically adapted to thrive on a diet with varied fresh meat and fresh fish, supplemented with vegetables, fruits and grasses. Prairie Poultry from Acana Classics is made with whole eggs and meat from free range chickens and turkeys. This dog food is full of meat proteins and Omega 3 fatty acids that support your dog's condition. What's more, Prairie Poultry contains low-glycaemic oat groats that contribute to reducing fat storage and promote a stable blood sugar level. This food is suitable for all breeds and phases of life. Chicken meal (25%), cut oats (23%), fresh chicken (5%), fresh chicken organ meat (liver, heart and kidneys) (5%), whole red lentils, whole green peas, whole green lentils, fresh turkey (4%), fresh whole eggs (4%), chicken fat (4%), whole Garbanzo beans, whole yellow peas, whole oats, herring oil (3%), sun-dried alfalfa, lentil fibre, dried brown seaweed, fresh pumpkin, fresh butternut squash, fresh parsnip, fresh kale , fresh spinach, fresh carrots, fresh Red Delicious apples, fresh Bartlett pears, freeze-dried chicken liver (0.1%), salt, fresh cranberries, fresh blueberries, chicory root, turmeric, milk thistle, burdock root, lavender, marshmallow root, rosehips, Vitamin A, D3, E, choline chloride, zinc chelate, Vitamin B5. Have you used Acana Classics Prairie Poultry before? Let us know what you think about this product. A dog with very sensitive digestion was gradually weaned off chicken and rice hand cooked each time and on to Acana kibble. Nothing else worked.